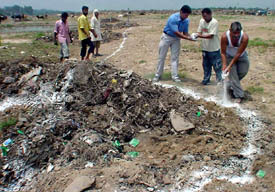 Reacting to the demands of residents of Dadumajra village for the shifting of the dumping ground that is emanating methane, the Chandigarh Administration today considered fencing the area where the gas was found or dig a trench around it. There has been no response from students to the special inquiry commission set up by Panjab University to probe into the violence on the campus on July 30 that left three students seriously injured. Pension scheme for university employees tops the agenda for the elections to the Panjab University Teachers Association (PUTA) scheduled for tomorrow. There are two major groups in the fray, one of which has Dr Harjinder Singh “Laltu” of the Chemistry Department contesting for the post of the president and the other group has Dr J.K.Chauhan of the Department of Laws. Calling for a complete change in the Panjab University Teachers’ Union (PUTA) leadership, Dr Harjinder Singh, standing for the post of President in the forthcoming PUTA elections, addressed a press conference at the Department of Chemistry, Panjab University, yesterday. The spurt in the number of private engineering colleges, polytechnics and “study centres” in Punjab in the past five years or so is likely to create a problem of placement for young engineers. 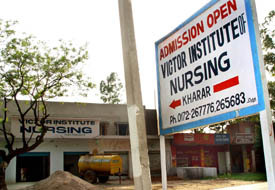 A large number of private nursing institutes, enjoying the patronage of ruling party politicians, have mushroomed in Punjab in flagrant violation of the norms laid down by the state government and the Indian Nursing Council. A Punjab minister and an Officer on Special Duty (OSD) to the Chief Minister are learnt to be amongst the patrons of some of these institutes, which have even gone ahead with the admission process. The joint operation by the Army, the Air Force and the Manali Institute of Mountaineering and Allied Sports, Operation Punaruthan, to search and recover the remains of Analov-12 (AN-12) aircraft which crashed on February 7, 1968, has started progressing well. Laughter filled the air as sisters throughout the city tied the thread of love on the wrists of their brothers to strengthen the bond between them on the occasion of Raksha Bandhan today. Twentysix orphans from a special village known as Save Our Souls near Rajpura were the guests of the Punjab Governor, Justice O.P. Verma. They were accompanied by women caretakers and co-workers to Punjab Raj Bhavan to tie rakhi to him. The three-day Raksha Bandhan celebrations by the Prajapita Brahma Kumaris Ishwariya Vishva Vidyalaya concluded with a special function organised in the evening in Phase VII here today. The master plan of the city does not have specific spots where garbage could be collected. As a result, garbage bins with litter around them are marring its beauty. “The master plan does not provide for garbage collection spots across the city,” an official at the Medical Officer Health Department told Chandigarh Tribune. For 29-year-old Ravi Gupta, a businessman of Panchkula, it was a scary experience which he is not likely to forget. Talking to TNS, Mr Gupta said his brush with death took place around 11.15 a.m. today near his factory. A one-day excursion tour to the Thunder Zone amusement park here will be organised for physically challenged children by the National Society for Child Artistes on August 13. The chairman of the society, Mr Ajit Salani, said more than 300 such children from all over the state would take this tour. A three-day workshop, organised by the Department of the Adult Education in collaboration with Punjab National Bank, on the working of self help-groups, concluded at the Female Literacy Home, Sector 42, here yesterday. The 34th Jhulan yatra festival concluded at Sree Chaitanya Gaudiya Math in Sector 20 today on the eve of Shri Baldev Poornima. The festival began on August 8. Devotees participated in the mahotsav in large numbers. According to Vaishnav Panchang, Sree Krishna Janamashtami festival will be celebrated on August 20 at the temple. 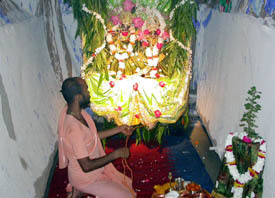 A view of the idols of Lord Krishna and Radha on a “jhoola” on Tuesday. A Sector 37-based organisation, the Hindu Parv Mahasabha, has shot off a letter to the UT Administrator, Justice O.P. Verma (retd) saying that the holiday in city on August 20 should be on August 19 instead of August 20. A bank manager and a forester are among five persons who will be awarded during the Independence Day celebrations. The Chandigarh Administration announced the names today. To commemorate India’s Independence Day, Discovery Channel has planned a series of India-specific programmes to be aired on August 15. The Independence Day special programmes will highlight various facets of India and pay a tribute to its rich culture and heritage. The body of Navdeep, who was found dead under mysterious circumstances in his house in Phase VII here yesterday, was handed over to his relatives by the police without a postmortem today. At least three cases of theft have been registered in different police stations and one person has been arrested during the past 24 hours. Raju of Sarabasti district, Uttar Pradesh, was arrested yesterday allegedly for stealing a bicycle. 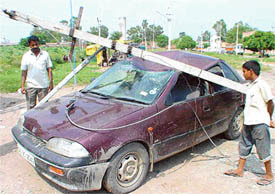 The complainant, Mr Nardev Sharma told the police that Raju was caught red-handed. The police rounded up 102 persons in Mauli Jagran in the wee hours today as part of its campaign to ensure a trouble-free Independence Day. A team of around 200 policemen, including commandos, cordoned off the area at 4 am before entering the interior of the colony. To tackle the problem of filling of more than one form by candidates for the same examination which leads to the harassment of students and their parents and delay in the declaration of results, the Punjab School Education Board has decided to introduce a change in the forms for the examinations to be conducted in 2004. Angry parents of candidates for the Class XII compartment examinations held in July laid siege since morning to the office of the Central Board of Secondary Education (CBSE) in Sector 32 here today to demand the handing over of confidential results of their wards. NSS cadets of MCM DAV College, Sector 36, planted 100 saplings of neem on the college campus here yesterday. The Principal, Ms Usha Gupta planted the first sapling. Raksha Bandhan brought a ray of hope and cheer for the 150 slum children who are part of Durga Das Foundation's night school projects. 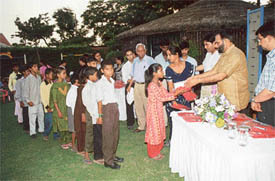 In their midst today was the Adviser to the Administrator, Mr Virendra Singh, distributing T-shirts and salwar kameez. 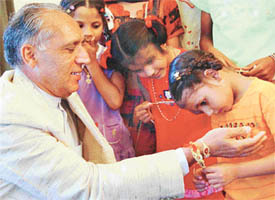 The Adviser to the Administrator, Mr Virendra Singh, distributes gifts to slum children of a night school in Chandigarh on Tuesday. Nearly150 students from 60 schools of Chandigarh, Panchkula and SAS Nagar showcased their singing talent in a folk song competition organised by the North Zone Cultural Centre at Kalagram in Manimajra here today. A municipal councillor has demanded that a vacant piece of land next to Government Elementary School in Phase V should be attached to the school. In a letter to the Chief Administrator, PUDA, Mrs Deep Kaur Shyan, a resident of Phase V, has said a piece of land lying vacant between Shri Hari Mandir and the school building in the area had not been earmarked for utilisation. She requested that this piece of land be attached to the school for further expansion. Admissions to three streams of management courses, MBA, MBA (IB), MBA (HR), being offered by University Business School, Panjab University, for the session 2004-2005, will begin on November 23 through CAT conducted by IIM, Kolkata. Two activists of the Haryana Students Association (HSA) — Satinder Dahiya and Dharmender Balhara — president and chairman of the HSA were today granted bail by a local court. The two were allegedly involved in a case of rioting in the general house of the HSA at the Students Centre on August 1. The NRI daughter versus parents case culminated today with the Punjab and Haryana High Court ruling that the girl, unwilling to stay back in the country, may be sent to Canada. Success follows Dr Nishchinta Khurana wherever she goes. From being a journalist with Zee News she has come a long way in the filmmaking business. In a span of 10 years, she has made more than 30 documentaries, 10 short films and a number of music videos for Indian and international channels. SHE enjoyed the Legend of Bhagat Singh five times — thrice with her parents, twice with her guy. Nay, not because she was in love with Ajay Devgan, but is a "patriot at heart". At least, this is what the chirpy little under-grad loves to tell everyone around. Well, she is also aware of the fact that it is fashionable to be a loyalist… but that's another story. HEY folks, the rainy season is still not over. So if you have been asking yourself "which colour should I be wearing during the downpour?" it is justified. Well, here is a complete guide, complied just for you to celebrate Monsoons in 2003. Hundreds of retired Central Government employees living in Chandigarh find themselves at risk of being denied benefits under a Central Government-run health scheme, due to an oversight or wrong interpretation of rules.